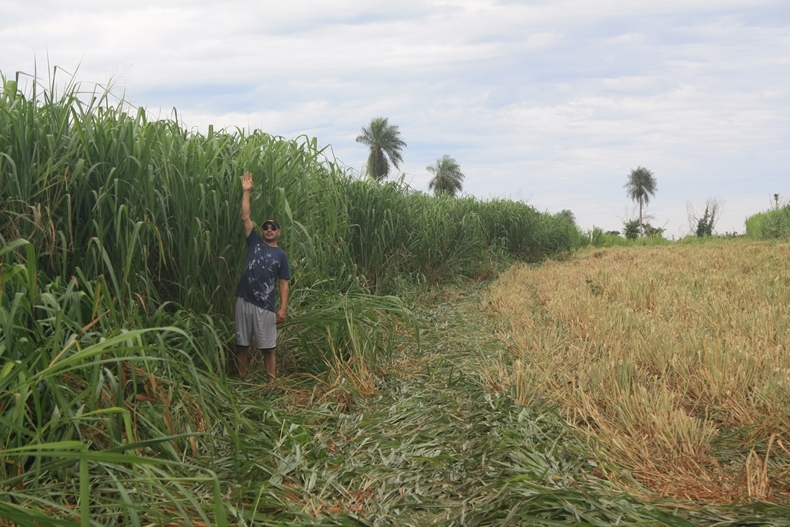 Guinea grass as energy crop for biomass can be managed and produce great results in tropical areas where not many alternatives are available. Its scientific name is Panicum maximum and it is native to tropical Africa and is now widely naturalized in the tropics. It is naturally found in open grasslands, woodland and shady places within 16.3°N and 28.7°S. The species yields can range from 10 to 30 t DM/ha/year (Cook, 2005). Productivity will depend on the cultivar, rainfall and fertilization. Its management for silage biomass to be used in a digester for biogas production will be similar to traditional practices for forage. It allows combinations with other grasses as well as Leucaena or other trees in agroforestry patterns. When it is produced for lignocellulosic biomass to be dried and baled specific techniques need to be considered to achieve low cost biomass. Typical costs in the Caribbean range from 20 U$D/ODT (oven dried ton) at farm gate in the form bales (15% moisture level or less). Guinea Grass is considered as a suitable plant to stop soil erosion on slopes (it has dense root mats) while providing valuable fodder. Environmental impacts and life cycle assessments. Biodiversity evaluations and risk evaluation.